Got Diamondhead VRS Drop-In and Free-Floating Handguards or any Mil Std M1913 Picatinny rail systems? Equip it with Diamondhead’s DIAMOND Flip-Up Rear Sight, for faster and greater precision. 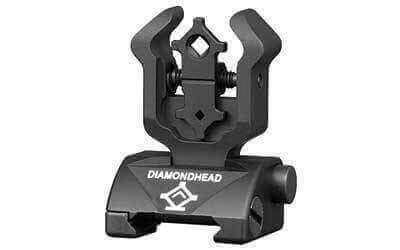 Diamondhead’s DIAMOND Flip-Up Rear Sight’s revolutionary design incorporates the original and proprietary Diamond-Shaped Apertures™ (Pat. & Pat. Pend.) and a re-designed upper housing – allowing the eye to place the front sight post in the exact center of the rear aperture.